What a fantastic February sunset and this was taken by my mobile phone. It was bitterly cold at the end of the day so our pregnant ewes were really pleased to walk in to the shed. Sunset colours are really extraordinary these days. Out on Treginnis headland, west of St Davids in Pembrokeshire, we can see amazing sunsets and also sunrises. Check us out for your winter short break at Ty Mortimer holiday cottage. 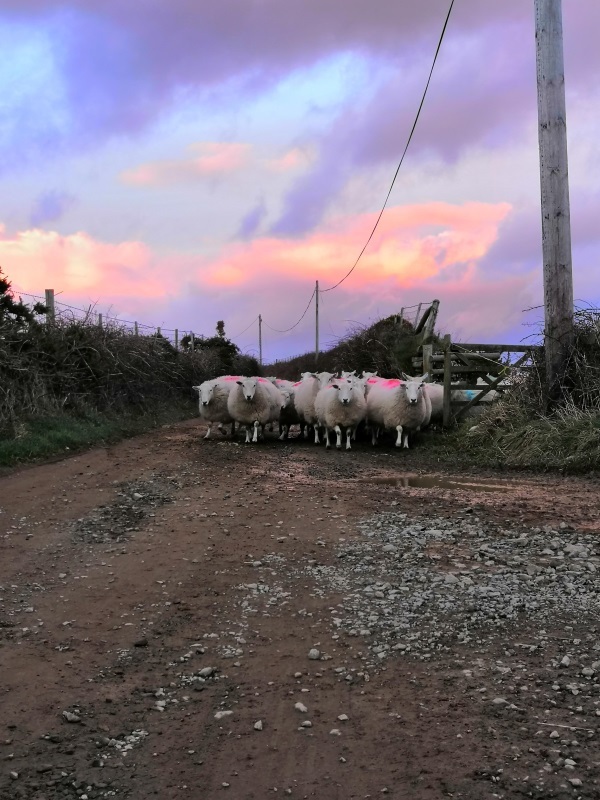 Our pregnant ewes go out to graze in the day and with the help of the children from Farms for City Children Lower Treginnis, the ewes come back in in the early evening. The ewes are the only ones who do not appreciate the February sunset, they are waiting to eat their haylage. Lambing started at the begining of January with about 50 ewes due. Our main flock start lambing on March 2nd therefore very busy times ahead. The old saying of red sky at night, shepherd’s delight, was true since today we have had a warmer day.